Compressed air flows through the inlet (1) into the plenum chamber of the Super Air Knife. Multiple channels inside direct the flow to a precise, slotted orifice. 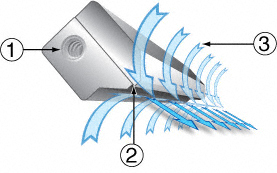 As the primary airflow exits the thin slotted nozzle (2), it creates a uniform sheet of air across the entire length that immediately pulls in surrounding room air (3). Velocity loss is minimized by entraining the room air into the primary airstream. The result is a well defined sheet of laminar airflow with hard-hitting force and minimal wind shear. Most plants try to limit compressed air usage and eliminate blowoffs that exceed OSHA noise level requirements. The new Super Air Knife has been engineered to deliver a uniform, high velocity, high volume sheet of air with low noise and minimal air consumption. As shown by the chart, it's easy to see why the Super Air Knife is the best choice for blowoff, cooling and drying applications. The Super Air Knife reduces compressed air usage by 15% when compared to EXAIR's Standard Air Knife or by 63% when compared to a drilled pipe! Noise level of the Super Air Knife is 6 times quieter than the Standard Air Knife and 11 times quieter than the drilled pipe! The Super Air Knife is available in nine standard lengths of 3", 6", 12", 18", 24", 30", 36" , 42" and 48" (7.5, 15, 30, 46, 61, 76, 91, 107 and 122cm) in Aluminum, and eight standard lengths of 3", 6", 12", 18", 24", 30", 36" and 42" (7.5, 15, 30, 46, 61, 76, 91 and 107cm) in Stainless Steel. Special lengths are available. Any number of Super Air Knives may be installed across a given area. Materials of Construction: The Super Air Knife is available in either aluminum or stainless steel construction. Mounting: The Super Air Knife can be supported by the compressed air pipe. Tapped holes (1/4-20) on the bottom are also provided. Regulation: A pressure regulator on the compressed air supply provides infinite control of flow, force and air consumption. Kits include a pressure regulator that is sized for flow. Shim Sets: The compressed air exhausts through a gap which is set with a shim positioned between the cap and the body of the Super Air Knife. Force and flow through the Super Air Knife may be easily increased by adding shims to open the gap. 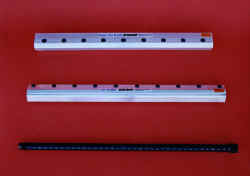 Kits include a shim set (three additional shims). The Super Air Knife uses 63% less air and is 11 time quieter than drilled pipe!